A soft, mild cheese made from whole milk or part-skim milk; buffalo mozzarella is made from water buffalo milk. Mozzarella Cheese has a unique stringy texture due the process of pulling and stretching it during production. This cheese melts well, making it a popular topping for pizzas and a key ingredient in many Italian-style dishes. A good source (100 g supplies around 50%% of the daily requirements) of calcium and phosphorous. Fresh mozzarella is generally white, but may vary seasonally to slightly yellow depending on the animal's diet. It is a semi-soft cheese. Colors: white, cream, very light yellow. Mouthfeel: Soft. firmer than cream cheese, But pretty soft. Choosing: For a low moisture mozzarella cheese look for one that is firm to touch, shows no mold. For a high moisture mozzarella be sure to check the date on the package as this cheese is better the fresher it is. Buying: Widely available in the USA in general grocery stores. Some specialty stores may have the highest quality buffalo mozzarella. Procuring: The process of making mozzarella is called pasta filata, which means the curds are heated in water or whey until they form strings (hence the term "string cheese") and become elastic in texture. The curds are stretched, kneaded until smooth, and then formed into round balls to make fresh mozzarella cheese. 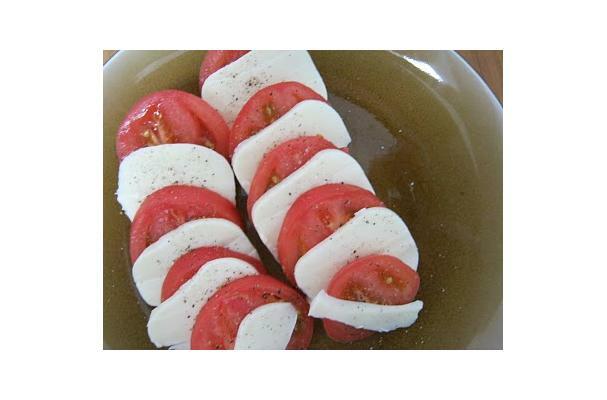 Mozzarella of several kinds are also used for most types of pizza, lasagna, or served with sliced tomatoes and basil in Insalata caprese. Thawed mozzarella is best used only in melted applications. Cleaning: Fresh mozzarella is best at room temperature. Remove it from the refrigerator two hours before you plan to serve it. Due to its high moisture content, it is traditionally served the day it is made, but can be kept in brine for up to a week, or longer when sold in vacuum-sealed packages. Low-moisture mozzarella can keep refrigerated for up to a month, though some pre-shredded low-moisture mozzarella is sold with a shelf life of up to 6 months. Processed mozzarella can be frozen up to six months, but it will become crumbly and lose moisture when thawed. Thaw slowly in the refrigerator and hold it at least a week to let the liquid re-absorb before using. History: Mozzarella - which is derived from the Neapolitan dialect spoken in Campania - is the diminutive form of mozza (cut), or mozzare (to cut off) derived from the method of working.Scamorza cheese is a close relative, which probably derives from "scamozzata" ("without a shirt"), with allusion to the fact that these cheeses have no hard surface covering typical of a dry cured cheese.